That's right. 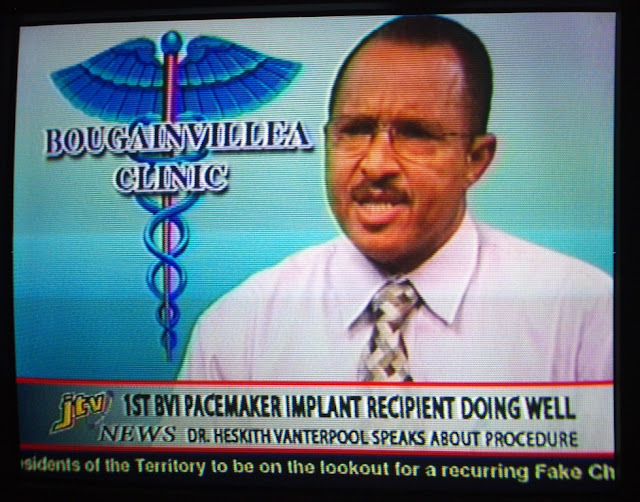 The big advance in medical technology this month is the first BVI pacemaker implantation. The first pacemaker implantation in the world, for those who are unfamiliar, occurred in 1958. By the mid-1970s, implanted pacemakers had become common throughout Europe and the US. Now, over 50 years after the first pacemaker was implanted, the British Virgin Islands have finally caught on and are beginning to do this procedure as well. Up to this point, any patient needing such complex treatment would either have had to go to Puerto Rico, or suffered along without it. I'm glad I can easily go to the US for medical treatment when needed. OMG! Where is paradise now?